Stephen Chesley, Mike Williams, Edward Wimberly, and David Yaghjian are friends and full-time artists living and working in South Carolina. For the past 12 years they have convened at Gallery 80808 in January with a selection of work from the course of the past year to hang an exhibition. This exhibition began as a holiday social where we would get together with our friends and collectors to catch up and look at examples of our production from the previous year. 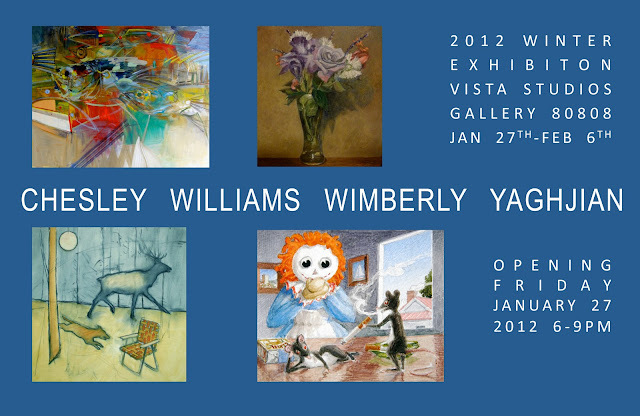 Each of these artists have worked diligently throughout their careers to create artwork that is distinctively their own. Stephen Chesley paints poetic and dramatic landscapes where saturated colors are juxtaposed against rich dark grounds. He is dedicated to creating daily visual records of a landscape that is devoid of the unsightly evidence of man’s presence. If and when an actual figure does appear in his work, it is someone who is fishing or oystering – someone who is reliant upon the earth for sustenance. As the casual observer, Chesley places you in the unique position of viewing a scene – an important place which he chooses to preserve as a reference in time. Mike Williams’s interest in fish, fishing, and the habitats where fish may be found, has been the primary subject of his work throughout his career. His vibrant and bold abstract paintings are expressionistic and loose, with a palette that ranges widely from earth tones to pure cadmium colors. At times, however, focus shifts and Williams’s work takes a more representational turn. While the choice of subject matter reflects his love of nature and fishing, the actual artwork – whether paintings or sculptures – reveals the enthusiasm with which he works. A great love of music manifests itself in the lyrical quality of his compositions where his subjects assume ever-shifting forms. Edward Wimberly’s pastels, oil paintings, and ink drawings sublimely merge fancy with a true surrealist view of society. His carefully crafted pictures delve into philosophy, state of mind, and serve as commentaries on life. Wimberly thoughtfully and suggestively weaves a myriad of surfaces and textures into his symbolist works such as: patterned cloth or drapery, chrome, gold, porcelain, and glass. Surprising arrays of unexpected elements are combined into a single work for the sole purpose of illustrating an idea or thought in a completely unique way. Within his narratives, it’s not uncommon for inanimate objects to literally come to life through his beautifully executed renderings, and the viewer is often drawn into a scene where they too become a participant. David Yaghjian is dead serious, almost. Painting is a mandated must in his life. The reality of being an artist and having heightened sensitivity causes him to respond visually. While it is said that the character seen in much of his work resembles him, it more so represents mankind – all of us. Whether the impetus be social, political, or mythical, and whether his muse be the psyche or observed phenomena, his pictures describe the human condition. Expressions of joy, success, failure, illness, and well-being can be found here. The pictures engage, and, on occasion, lead the viewer to consider his own condition and mortality. In addition to the figurative paintings, Yaghjian has been creating three-dimensional versions of his character in the form of cardboard or pine board cut-outs.